(Rick Egan | The Salt Lake Tribune) Two sage grouse face off while strutting on a lek in the Parker Mountain area, near Loa, Utah, Friday, April 22, 2016. Reno, Nev. • Destruction of sage grouse habitat by a series of large wildfires has prompted a ban on hunting for the game bird this fall across a stretch of Nevada that is nearly twice as big as the state of Delaware. The Nevada Board of Wildlife Commissioners approved the emergency closure Friday of two hunting units in Humboldt and Elko counties. The closure covers more than 3,500 square miles between the Idaho line and Interstate 80, about 200 miles northeast of Reno. The Nevada Department of Wildlife says at least 39 known breeding sites supporting about 750 male sage grouse were destroyed in July by the Martin Fire. The agency says the fire that started in Paradise Valley north of Winnemucca burned 689 square miles of mostly rangeland — the largest fire in Nevada history. Visible from a NASA satellite, it came on the heels of another wildfire last year that burned 267 square miles north of Battle Mountain. “This fire negatively affected one of the few remaining stronghold habitats for greater sage-grouse and a myriad of other sagebrush obligate species in Nevada,” said Shawn Espinosa, an upland game staff specialist for the state agency. Hunting units 051 and 066 will remain closed for sage grouse until further notice along the Idaho line from McDermitt in the west to Owyhee in the east and as far south as just west of Battle Mountain. Another fire currently burning about 15 miles north of Battle Mountain has charred more than 60 square miles. Greater sage grouse — a ground-dwelling bird about the size of a chicken — once numbered in the millions across much of the West, but the U.S. Fish and Wildlife Service now estimates the population at 200,000 to 500,000. Experts blame energy development, along with wildfires, disease, livestock grazing and other causes. Their range covers parts of 11 Western states and two Canadian provinces. The largest concentrations are in Wyoming, Montana, Nevada and Idaho. State wildlife officials say the two big Nevada fires not only burned grouse breeding sites but also destroyed priority winter habitat, which will likely affect the bird’s annual production and survival rates. So far, no other states have implemented grouse hunting restrictions as a result of fires. 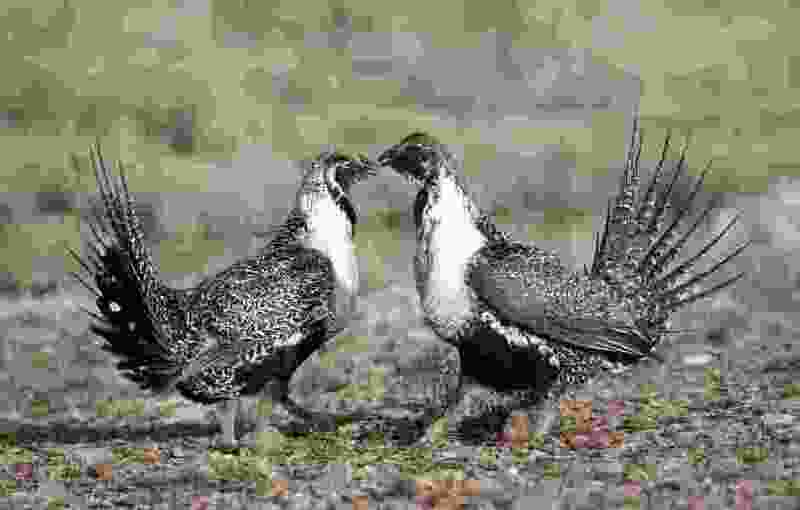 Wildlife biologists have said in the past that hunting doesn’t generally threaten the survival of sage grouse populations. Espinosa said the state is working with federal land management agencies, private landowners and nongovernmental organizations on restoration plans for the Martin Fire, and procurement of seed from several sources.